When I started my first stint at fishkeeping at 8 years old (80’s), nobody told me how to fishless cycle my aquarium, or about the beneficial bacteria in an established aquarium. About all I knew was that I needed to dechlorinate the water. Despite my ignorance, the fish (generally) survived. Round two of fishkeeping (started a few years ago) had me become a bit more informed on a better way to start off a new tank – the right way. First of all, the problem with new fish in a small, enclosed body of water is that they produce ammonia as waste. As it happens, ammonia is not good for fish. It makes them unhealthy and raises their risk for getting sick. Nature’s solution to this issue of fish poisoning themselves with their own waste products is called the Nitrogen Cycle. The beauty of the Nitrogen Cycle is that it works in our enclosed little ecosystems just like it does in nature. Stage 1: As I said, fish waste is primarily ammonia. This is direct from their urea, but also from the breakdown of their solid waste. In addition, leftover food (from overfeeding) will also rot and produce ammonia. Stage 2: Specific bacteria called “nitrosomonas” feed on ammonia. That is great news because, in an aquarium where this bacteria colony are established, ammonia is removed, thus eliminating the toxin and risk to your livestock. The bad news is that nitrosomonas creates waste of their own, called Nitrite (NO2). Unfortunately, Nitrite is also a toxin to fish and invertebrates, with effects similar to ammonia exposure. Stage 3: Another specific set of bacteria called “nitrobacter” finish up the important job of making your tank safe. They feed on the toxic Nitrite and produce Nitrate (NO3). Nitrate is not toxic to aquarium livestock in controlled quantities. Keeping Nitrate less than around 20 ppm (parts per million) is generally a safe target. Over time, nitrate will (in an aquarium without plants) keep building. This is what regular (partial) water changes are primarily for – to keep the Nitrate levels in the healthy range. Stage 4: For those of us that keep live plants, they play a wonderful role in completing the final step of the Nitrogen Cycle. Live plants consume Nitrate as part of photosynthesis. The byproduct given off from photosynthesis is oxygen, which helps oxygenate the water, which is the source of respiration for fish and other livestock. For those that keep very low maintenance aquariums (with a long duration between water changes), plants are key to limiting Nitrate build-up. The challenge for setting up a first time aquarium is that the tank will not have the two strains of Beneficial Bacteria (BB) established in quantities that can clear out the ammonia produced by fish. 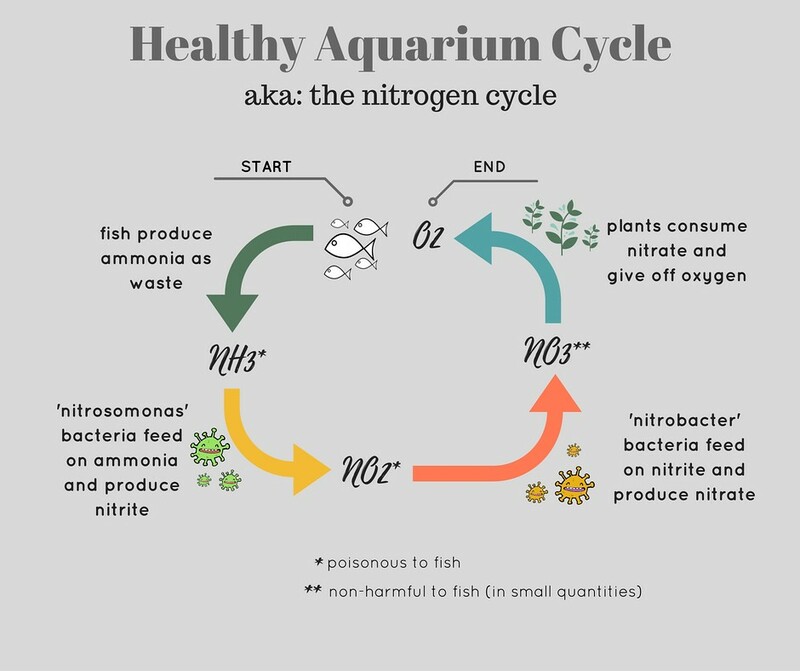 There are a few ways of establishing the Nitrogen Cycle (cycling your aquarium), and I will quickly go through two alternatives to fishless cycling. One way is to perform a Fish-In cycle. This is where you put the fish in and they produce the ammonia waste to start feeding the beneficial bacteria colonies. The problem with Fish-in cycling is that it can take weeks and weeks for the cycle to establish where Ammonia and Nitrite are cleared out. The entire time, the fish are exposed to toxins and are being harmed. Essentially, this is what I did with my aquarium start years ago. 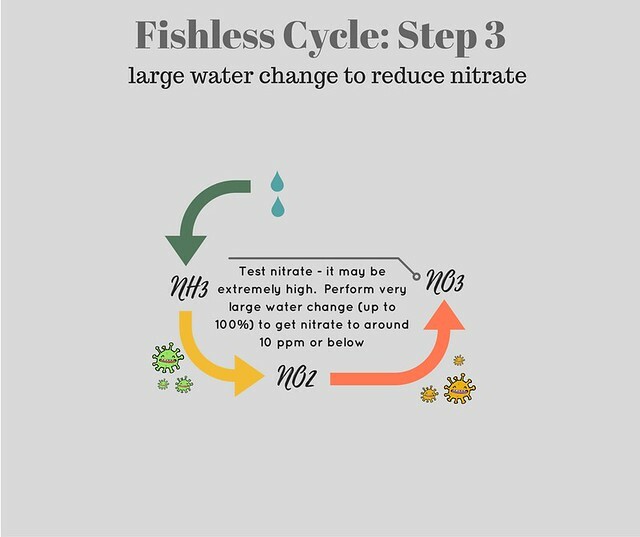 The only way to limit the damage if trying a fish-in cycle is to perform regular water changes to reduce the quantity of Ammonia and Nitrite. These water changes might need to be every other day, or daily depending on the livestock load. Several companies make products that claim to cycle your aquarium for you. I do not place much faith in them working. I would bet that many don’t actually start the cycle, but may neutralize the toxins instead as a stop-gap measure before your tank cycles. However, if you do want to go this route, make sure to use a product that actually adds the beneficial bacteria strains to your tank – I believe for these types of products you are looking for ‘Nitrospira’ bacteria. As you can imagine, creating a product that is shipped and sealed in a dark bottle and that needs to house live cultures of bacteria is challenging. Again, I haven’t tried this method, but if you absolutely want an ‘instant’ cycled aquarium that you can put your fish right into, I would start with Tetra Safe Start . Make sure to read the instructions; you purchase a bottle that is appropriate for your tank size. When you are ready to add livestock, you dump the entire bottle in (in other words, don’t ‘dose’ down for your tank volume). No need to expose your fish and shrimp to toxins when you can perform a fishless cycle and get all the beneficial bacteria established before you put them in. The only downside is that it takes time to get the aquarium cycled. I will talk more later about how long the fishless cycle might take and how to speed it up. 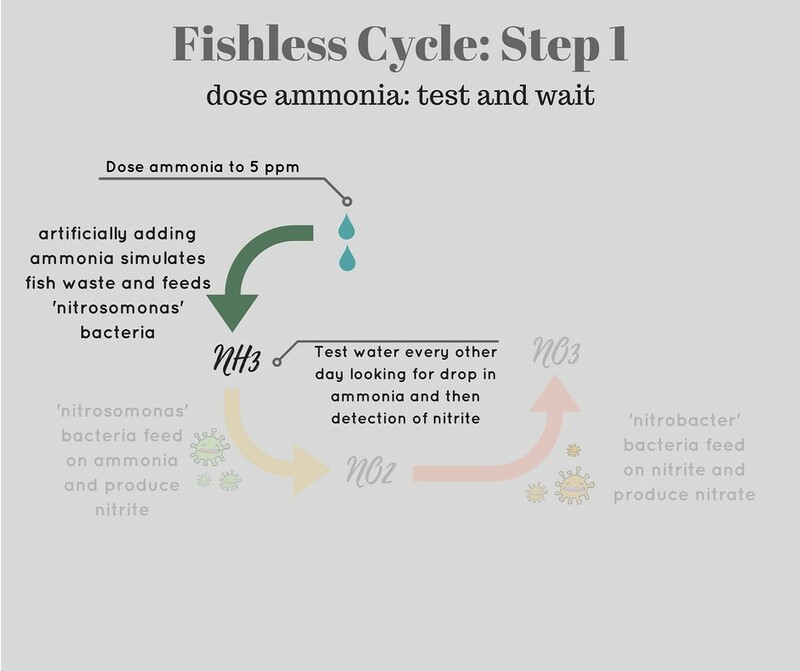 Ammonia : The premise of a fishless cycle is to feed the beneficial bacteria of the nitrogen cycle artificially by dosing ammonia. It’s critical to use pure ammonia. More specifically, it needs to only contain water and ammonia (usually around 10% ammonia) with no dyes or soaps (known as surfactants). Please choose your source wisely; labels often won’t list the soaps that, if introduced, will wreck your aquarium. I trust two sources, Ace hardware (if you can go into a store) and Ammonia Clear (available on Amazon) . 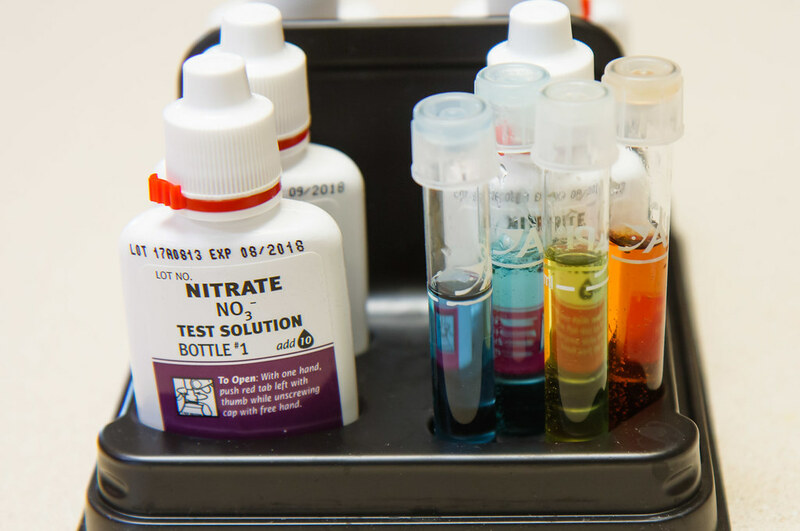 Test Kit : You need to track Ammonia, Nitrite, and Nitrate to know where the cycle is and what to do next. The API Freshwater Master Test Kit is all I use – I know it works and once you get some practice, it is very quick getting the water tested and results back. Avoid the test strip type kits as they are not accurate or reliable enough. Dosing Pipettes : These have proven themselves as a great tool for dosing in a small tank. You use them to measure out known quantities of ammonia during the fishless cycle. Seed Material (optional): This is anything that is taken from an established aquarium and can be transferred to your new tank. I will discuss this more below in the ‘Tips’ section. Once you have these items, you are ready to start the fishless cycle process. First of all, you need to get your aquarium setup. The pumps need to be working and turned on. You don’t need the lights on at all during this process. Regarding plants, I would suggest you wait and plant after the cycle is established. We will be dosing ammonia and this can wreck some types of plants. Also, make sure to dechlorinate your tap water. Chlorine can kill off the beneficial bacteria that we are working so hard to establish. I use Seachem Prime ; it has never failed me. After you add the ammonia, then you need to start regular testing of ammonia and Nitrite. You actually could get away with only testing ammonia and looking for the value to drop. 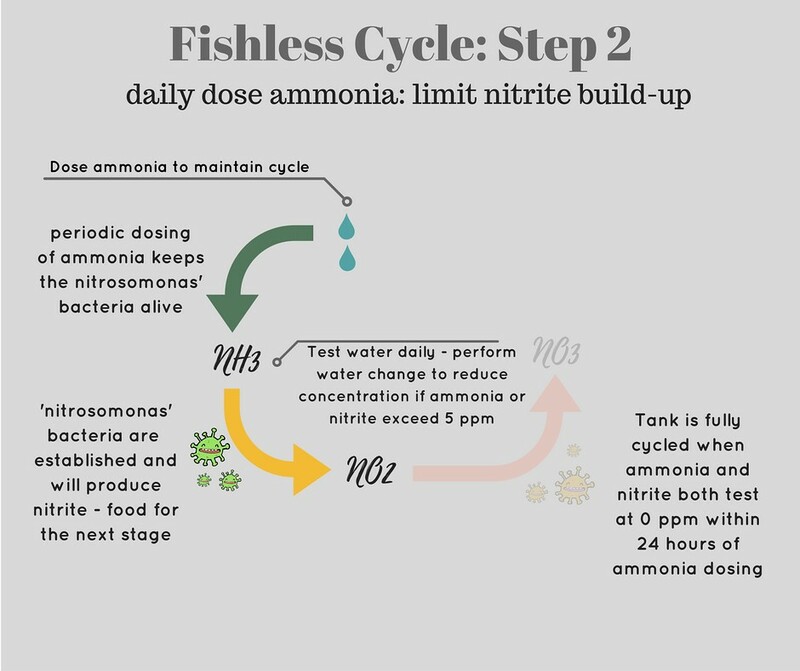 Your tank is a closed system, so when you add the ammonia at 5 ppm, it will stay at 5 ppm until the “nitrosomonas” bacteria develop in great enough numbers to reduce the ammonia. Any drop in ammonia ppm will shortly result in detectable Nitrite. It will generally take 7 to 14 days to complete Step 1 (detect Nitrite). At this point, the first crew of “nitrosomonas” bacteria are in place and are making Nitrite as waste, which will be food for the next crew of “nitrobacter” bacteria. The “nitrosomonas” need food to stay alive, so start dosing ammonia as needed. You might not need to dose every day; just test and add as needed, when ammonia reads 0 or 1 ppm, go ahead and add to around 2 ppm. Other than that, it’s a waiting game for the second group of bacteria to exponentially grow; you know that this has happened when Nitrite shows a drop and Nitrate is detected in a test. A second important part of this phase is to test ammonia and nitrite and make sure that they don’t exceed 5 ppm. It isn’t that important with Ammonia as the bacteria will reduce this if it gets a little too high (from your dosing). However, until the “nitrobacter” bacteria are established, Nitrite will keep climbing higher and higher. Very high levels of Nitrite can stall out the cycling process. The API Nitrite test does not read higher than 5 ppm, so if you get that reading, you have no idea how high it is (6 ppm? 20 ppm? 100 ppm?). When you get a reading of Nitrite above 5 ppm, go ahead and perform a water change, then test Nitrite again the next day. If it is still above 5 ppm, perform another larger water change (70%). Keep doing this until you get it below 5 ppm. After a water change, dose ammonia in the necessary quantity to maintain around 2 ppm. I know you are probably worried that a water change will get rid of the bacteria you are working to grow – It doesn’t affect them as I will explain in the ‘Tips’ section below. This phase is often the longest and takes patience. I will attest that it is important to keep the Nitrite levels in check – my fishless cycle got stalled for this reason. The exiting part is when you test one day and ammonia has been reduced to zero (after you dosed 2 ppm the day before) and Nitrite is also reduced or eliminated! That is the official test to pass in order to be fully cycled: Dose 3-5 ppm of ammonia, test 24 hours later, and the result is no ammonia and no nitrite! It generally takes 3 to 4 weeks (from start to finish) to complete your fishless cycle. After you pass the 24 hour test to demonstrate the nitrogen cycle is established and clearing out both Ammonia and Nitrite, your test will probably reveal a sky high level of Nitrate. While Nitrate is not toxic is small levels, we can eliminate it and make for optimal conditions for incoming livestock. Perform a very large water change (as close to 100% as you can) to get Nitrate levels close to zero. You made it! Your time and perseverance has paid off and you now have optimized your tank to receive new fish, shrimp, and whatever other livestock you are planning. The beneficial bacteria established are strong enough for the full livestock loading of your tank, so you don’t have to phase in fish; you can add all of your planned occupants at once if you wish. If you are delayed in adding fish, you can keep dosing ammonia daily until you are ready (to keep feeding all the beneficial bacteria). Once you are ready, just perform your large water change to flush out Nitrate. Beneficial Bacteria Live on Surfaces: It’s important to understand that the beneficial bacteria we are developing do not live and grow in the water column; they live on surfaces. Glass, gravel, plants, and especially filter media all serve as a home to beneficial bacteria. Use ‘Seeding’ Material to Speed the Cycle: Since the beneficial bacteria live on surfaces, if you can take something from an established aquarium and put it into your tank when it is cycling, the bacteria will be present in greater numbers, and the whole process will move along much quicker. You can use some old filter media, decorations, rocks, wood, or gravel. Any good fish store will be happy to give you a bit of gravel or something else in a bag (wet to keep the bacteria alive) for free. Use Water Conditioner: Chlorine will stunt or kill the beneficial bacteria, so make sure to always dechlorinate the water that you put in the aquarium. 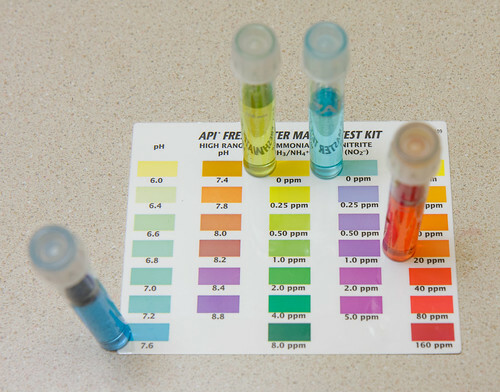 pH Level: The pH of your water is not all that critical. If it gets into the low 6’s then the cycle will probably stall. High 6’s or anywhere in the 7’s is fine. Temperature: Temperature isn’t critical, but the process may move quicker if you keep the tank temperature slightly elevated. This entry was posted in Aquarium Tips and tagged aquarium, beneficial bacteria, cycle, fishless cycle, new. Bookmark the permalink. in stage 4, “Live plants consume Nitrite as part of photosynthesis.” nitrite should be nitrate as well. Thank you so much! I got those corrections made. ites and ates got me down on this one. Thanks for writing this guide! One question – have you had success with cycling the Fluval Spec III, given its smaller size? I got a III to make a review but didn’t have it setup long enough to tell if it’s any more difficult to cycle. Should be the same, you just need to be accurate in dosing no more ammonia than necessary. Can you clarify something please? When you say “That is the official test to pass in order to be fully cycled: Dose 3-5 ppm of ammonia, test 24 hours later, and the result is no ammonia and no nitrate” is that correct? You seem to indicate that nitrate will go on and climb hence why a water change is done and why plants are great. Is the test really dosing 3-5ppm ammonia and then having the ammonia and nitrite be nearly 0? Since the nitrite will be food for bacteria which would produce nitrate? good catch. It should say no ammonia and no NitrITE. I will correct now. I have never cycled before and have my betta for 3 months now. I read that smaller tank environment can fluctuate ( in temp, bacteria? …) so in a fishless cycling, do I need to start with a 5 gal (+/- 2.5 gal) minimum ? My plan during cycling is to keep my betta in the 3gal while cycling a 0.8 gal container. When complete, I can take some water and filter from the cycled tank and into the 3gal tank. If the 0.8 gal is too small for cycling, I plan to get a big pail that’s safe for fishes. I’m not sure I’d bother – after three months you probably already have cycled the tank where the betta resides. Get a test kit and test for ammonia and nitrite. If both of those are zero, you are good and no need to cycle your current setup. If you get a larger tank, you can then cycle the new tank by seeding with something from your current tank (filter media, gravel, etc.). I’m a few newbie. I’m at Stage 1. I dosed to 5ppm ammonia right before I left town for a few days. I figured it could do it thing while I was gone. It is now 4 days later and ammonia tested at 2ppm with 0ppm nitrite. Does this sound right? I had imagined that as soon as ammonia dropped nitrite would increase. Will I be seeing nitrite increase soon? Do I need to add more ammonia in the meantime? Thanks! My class will be thrilled to see the tank up and running when they return from winter break. I’d say add some more ammonia to get you up around 5 ppm, then keep testing for nitrite every few days. It can be a slow process if you don’t start with a bacteria source to kickstart the cycle. Thank you. I’ll keep the ammonia levels up and see what happens. Out of curiosity I also tested the pH. It was above 8.0, is this too high for the growing bacteria? And the water is odd greenish color? Should I do something about the color now, or wait until the tank has cycled and then do a partial water change? That’s a great information !! Aquarium Nitrogen Cycling is the most important part of setting up a new fish tank. Most of the cycling process is automatic i.e it happens on its own. But the question is – how to start nitrogen cycle in aquarium. which I found in your article described in depth.